In the summer of 1839, the Prophet gave the name Nauvoo to the site where the Saints were gathering on the Illinois side of the Mississippi River. The name was of Hebrew origin, signifying “a beautiful situation, or place, carrying with it, also, the idea of rest.”1 Under the Prophet’s direction, the Saints began transforming the village of Commerce into a lovely city. They first replaced their huts and tents with frontier log homes, and then numbers of frame houses and substantial brick homes began to appear. They planted fruit and shade trees and vines and bushes to beautify their large lots. In their beautiful Nauvoo, the Saints hoped to find a peaceful place of refuge where they could put the persecutions of Missouri behind them. “A man who had stood high in the Church while in Far West [Missouri], was taken down with chills or ague and fever. While his mind as well as body was weak, disaffected parties soured his mind and persuaded him to leave the Saints and go with them. He gave some testimony against the Prophet. While the Saints were settling in Commerce, having recovered from his illness, he removed from Missouri to Quincy, Illinois. There he went to work chopping cordwood to obtain means to take himself and family to Nauvoo, and [give] a present to the injured man of God if, peradventure, he would forgive and permit him to return to the fold. … He felt that there was salvation nowhere else for him and if that was denied him all was lost as far as he was concerned. He started with a sorrowful heart and downcast look. “While [the man was] on the way the Lord told Brother Joseph he was coming. The Prophet looked out of the window and saw him coming up the street. As soon as he turned to open the gate the Prophet sprang up from his chair and ran and met him in the yard, exclaiming, ‘O Brother—–, how glad I am to see you!’ He caught him around the neck and both wept like children. We are to exercise the principle of mercy and forgive our brothers and sisters. Forgiving restores unity of feeling. The Prophet Joseph Smith said the following at a meeting with his counselors in the First Presidency and the Twelve: “I have sometimes spoken too harshly from the impulse of the moment, and inasmuch as I have wounded your feelings, brethren, I ask your forgiveness, for I love you and will hold you up with all my heart in all righteousness, before the Lord, and before all men; for be assured, brethren, I am willing to stem the torrent of all opposition, in storms and in tempests, in thunders and in lightnings, by sea and by land, in the wilderness or among false brethren, or mobs, or wherever God in His providence may call us. And I am determined that neither heights nor depths, principalities nor powers, things present or things to come, or any other creature, shall separate me from you [see Romans 8:38–39]. “Brothers William and Hyrum, and Uncle John Smith, came to my house, and we went into a room by ourselves, in company with father and Elder Martin Harris. Father Smith then opened our interview by prayer, after which he expressed himself on the occasion in a very feeling and pathetic manner, even with all the sympathy of a father, whose feelings were deeply wounded on account of the difficulty that was existing in the family; and while he addressed us, the Spirit of God rested down upon us in mighty power, and our hearts were melted. Brother William made a humble confession and asked my forgiveness for the abuse he had offered me. And wherein I had been out of the way, I asked his forgiveness. In late 1838, William W. Phelps, who had been a trusted Church member, was among those who bore false testimony against the Prophet and other Church leaders, leading to their imprisonment in Missouri. In June 1840, Brother Phelps wrote to Joseph Smith, pleading for forgiveness. The Prophet Joseph replied: “I must say that it is with no ordinary feelings I endeavor to write a few lines to you in answer to yours of the 29th [of last month]; at the same time I am rejoiced at the privilege granted me. “You may in some measure realize what my feelings, as well as Elder Rigdon’s and Brother Hyrum’s were, when we read your letter—truly our hearts were melted into tenderness and compassion when we ascertained your resolves, etc. 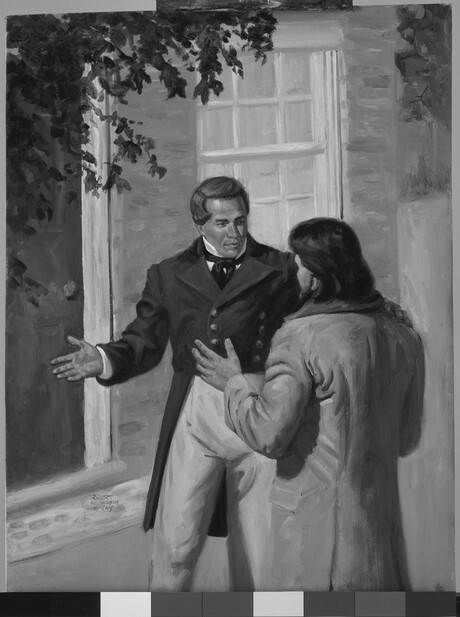 I can assure you I feel a disposition to act on your case in a manner that will meet the approbation of Jehovah, (whose servant I am), and agreeable to the principles of truth and righteousness which have been revealed; and inasmuch as long-suffering, patience, and mercy have ever characterized the dealings of our heavenly Father towards the humble and penitent, I feel disposed to copy the example, cherish the same principles, and by so doing be a savior of my fellow men. “However, the cup has been drunk, the will of our Father has been done, and we are yet alive, for which we thank the Lord. And having been delivered from the hands of wicked men by the mercy of our God, we say it is your privilege to be delivered from the powers of the adversary, be brought into the liberty of God’s dear children, and again take your stand among the Saints of the Most High, and by diligence, humility, and love unfeigned, commend yourself to our God, and your God, and to the Church of Jesus Christ. “Believing your confession to be real, and your repentance genuine, I shall be happy once again to give you the right hand of fellowship, and rejoice over the returning prodigal. “Your letter was read to the Saints last Sunday, and an expression of their feeling was taken, when it was unanimously resolved, that W. W. Phelps should be received into fellowship. This chapter includes several accounts of Joseph Smith forgiving others. Review these accounts on pages 391–92, 395–96, and 396–98. In what ways might these stories help someone who is struggling to forgive another? What blessings come into our lives when we forgive those who have offended us? Why do we sometimes have difficulty forgiving others? What can we do to develop a more forgiving spirit? Page 393 contains brief, wise statements about forgiving others. For example: “Bear and forbear one with another, for so the Lord does with us.” “Be merciful and you shall find mercy.” “Seek to help save souls, not to destroy them.” “We must be merciful to one another, and overlook small things.” What do you gain from each of these statements? In the paragraph that begins on the bottom of page 393, review the Prophet Joseph Smith’s words about the effect of kindness and tenderness. Why do you think this counsel is true? How have you experienced these principles in your own life? Review the paragraph that begins on the bottom of page 394. What problems might we avoid as we follow this counsel? Why is this counsel sometimes difficult to follow? How can we overcome the temptation to believe negative reports about others? In his efforts to forgive others, the Prophet spoke of his desire to “copy the example” of Heavenly Father (page 398) and live “according to the sublime and perfect pattern of the Savior” (page 392). As we strive to follow the example of Heavenly Father and Jesus Christ, what are some characteristics we should strive to develop? 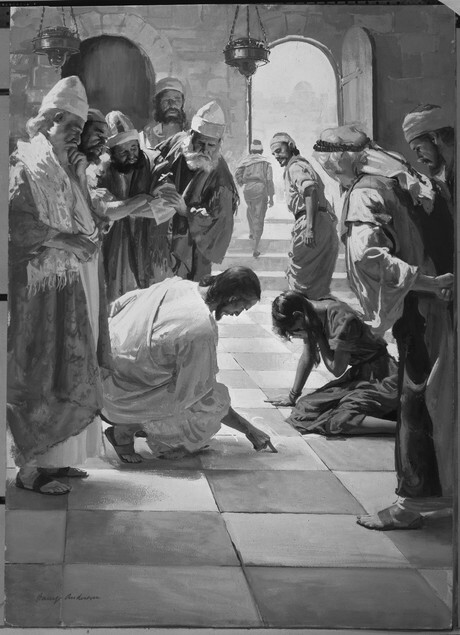 The Savior showing compassion toward a woman taken in adultery (see John 8:1–11). “Christ said He came to call sinners to repentance, to save them,” Joseph Smith declared. William W. Phelps, portrayed here with Joseph Smith after returning to full fellowship with the Saints, wrote of the Prophet who had so freely forgiven him: “Praise to the man who communed with Jehovah!” (Hymns, no. 27). History of the Church, 4:268; from a letter from Joseph Smith and his counselors in the First Presidency to the Saints, Jan. 15, 1841, Nauvoo, Illinois, published in Times and Seasons, Jan. 15, 1841, pp. 273–74. Daniel Tyler, in “Recollections of the Prophet Joseph Smith,” Juvenile Instructor, Aug. 15, 1892, p. 491; punctuation modernized; paragraph divisions altered. George Q. Cannon, The Life of Joseph Smith, the Prophet (1888), pp. 190–91. History of the Church, 6:245; from “A Friendly Hint to Missouri,” an article written under the direction of Joseph Smith, Mar. 8, 1844, Nauvoo, Illinois, published in Times and Seasons, Mar. 15, 1844, p. 473. History of the Church, 3:383; from a discourse given by Joseph Smith on July 2, 1839, in Montrose, Iowa; reported by Wilford Woodruff and Willard Richards. History of the Church, 2:230, footnote; from “To the Saints Scattered Abroad,” Messenger and Advocate, June 1835, p. 138. History of the Church, 5:19–20; bracketed word “yet” in original; paragraph divisions altered; from a discourse given by Joseph Smith on May 26, 1842, in Nauvoo, Illinois; reported by Eliza R. Snow. History of the Church, 5:23; from a discourse given by Joseph Smith on June 9, 1842, in Nauvoo, Illinois; reported by Eliza R. Snow. History of the Church, 5:498; punctuation modernized; from a discourse given by Joseph Smith on July 9, 1843, in Nauvoo, Illinois; reported by Willard Richards. History of the Church, 5:23–24; from a discourse given by Joseph Smith on June 9, 1842, in Nauvoo, Illinois; reported by Eliza R. Snow. Letter from Joseph Smith to Edward Partridge and others, Mar. 30, 1834, Kirtland, Ohio; in Oliver Cowdery Letterbook, pp. 34–35, Huntington Library, San Marino, California; copy in Church Archives, The Church of Jesus Christ of Latter-day Saints, Salt Lake City, Utah. History of the Church, 2:374; paragraph divisions altered; from the minutes of a council meeting of the First Presidency and the Twelve held on Jan. 16, 1836, in Kirtland, Ohio; reported by Warren Parrish. History of the Church, 2:343; from a letter from Joseph Smith to William Smith, Dec. 18, 1835, Kirtland, Ohio. History of the Church, 2:352–54; paragraph divisions altered; from a Joseph Smith journal entry, Jan. 1, 1836, Kirtland, Ohio. History of the Church, 4:162–64; second set of bracketed words in third paragraph in original; punctuation and capitalization modernized; paragraph divisions altered; italics deleted; from a letter from Joseph Smith to William W. Phelps, July 22, 1840, Nauvoo, Illinois.